The perfect accent to anything from a crisp black tuxedo to a semi-casual yachting outfit of fitted trousers and boat shoes, this 18k White Gold men's bracelet from Baraka is a textbook definition of "versatility". 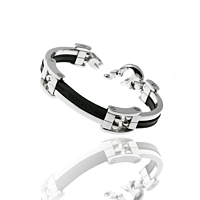 Its alternating rubber/White Gold band provides not only strength, but a subtle touch of aesthetic charm as well. For the gentleman who wants a durable accessory which can befit boardroom meetings as well as relaxing days with the family, this bracelet is ideal.